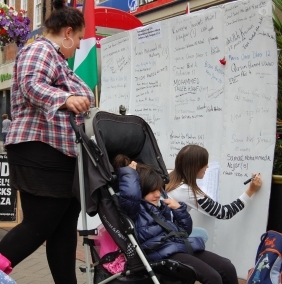 We created a memorial wall in Hastings town centre to commemorate those who were killed by the Israeli military in Gaza during the summer of 2014. More than 2,100 adults and over 550 children were killed; this included entire extended families and babies as young as 10 days. Selecting from a list of over 550 names of the children that were killed, individual passers-by chose a named child to remember. The pages of names seem overwhelming. Some added RIP; some chose a child of the same age as their own children; young people often chose teenagers of the same age and gender. The support and interest we had from local people was both encouraging and moving. As part of its first ever tour of the UK, the Freedom Theatre staged its production of 'The Siege' at St Mary in the Castle in Hastings. 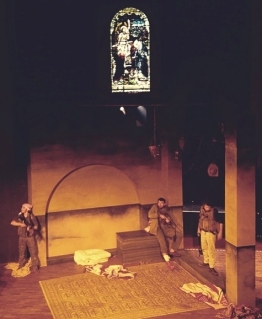 "The Siege" is based on the experiences of a group of resistance fighters who took refuge in the Church of the Nativity during the height of the second Intifada. 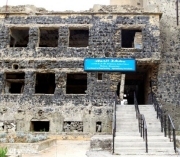 As St Mary in the Castle was originally a church, it is an ideal location. The play was clearly a triumph with the audience giving the cast 3 rousing standing ovations. The play turned out to be a powerful, emotionally charged example of cultural resistance at its best. On the 41st anniversary of the first Palestinian Prisoners' Day, we built a prison cell in the town centre and gave out information detailing mistreatment of Palestinian children in Israeli jails. 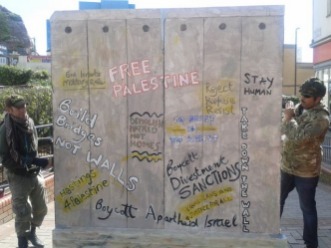 To highlight the way that Palestinians are harassed and humiliated in their daily lives, we built a mini replica of the wall in Hastings town centre. Israel's Apartheid Wall has been built within occupied Palestine, stealing fertile land, dividing communities, separating Palestinians from their farms, places of work and hospitals. More information here. The video of our replica wall event: click here. 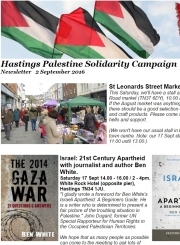 During the summer of 2014, people in Hastings took action and joined the world-wide opposition to Israel's campaign of terror against Gaza. The march started at the Pier and made its way to the Town Hall. With less than 2 days to organise this action, the response from local people was quite overwhelming. We publish an online newsletter. It covers news of - local activities; UK complicity in the occupation; situation in occupied Palestine; successes of the BDS (boycott, divestment and sanctions) movement. To be added to our mailing list, please email us. The Golan Heights - Israeli occupied territory. 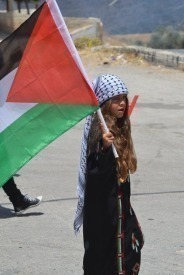 Three generations have grown up only knowing a life governed by the military rule administered by a foreign army. Israel is the only country in the world that prosecutes children in a military court. Many Palestinian children are arrested in the middle of the night, their homes are trashed and their parents are not informed about the reason or where they are being taken. Many are beaten, interrogated without a lawyer or parent present, abused for being Palestinian and endure sexual threats. Website showing the extent of Israel's destruction of Gaza. After the website loads, click on the Palestinian flag to enter the virtual tour. Then select different locations, using the photos on the right. We made £6,000 for Medical Aid to Palestinians (MAP) at our Art for Gaza sales. A big thank you to everyone who came to the 2 sales, and lots of thanks especially to all those who contributed paintings. Meeting with Dr. Jenny Tonge goes ahead despite sustained attack by Israel lobby. The Meeting The Zionists Tried To Stop! Ethnic Cleansing in East Jerusalem. Shepherds in the Jordan Valley. Letter to J. K. Rowling. The power of the Israel lobby. $210 billion Dutch pension fund PGGM announced its divestment from Israel's 5 biggest banks; the world's largest wealth fund ($820 billion) in Norway divested from 2 Israeli companies involved in illegal settlement building. Southern Water has been installing water meters made by Israeli company Arad. This company plays an integral part in Israel's illegal occupation of Palestine. Arad is an Israeli company that works extensively in the illegal Israeli settlements in the Palestinian West Bank. 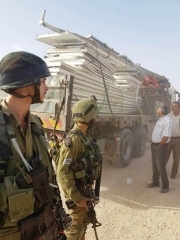 Not only has it installed 3,200 water meters in the illegal settlements of Ariel and Barkan, it has committed itself to a "..long term engagement including continued development and continuous service and support over the years." Make Waves at Southern Water. It has been estimated by the Israeli Committee Against House Demolitions that Israel has demolished 48,743 Palestinian buildings in the occupied territories since 1967. Source. 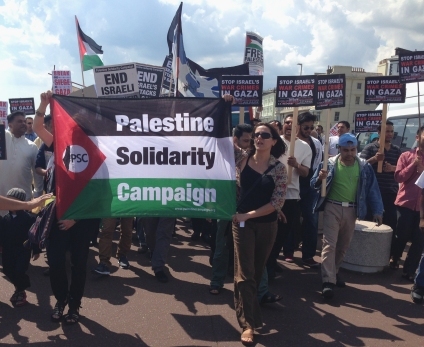 Several Hastings PSC supporters visited Brighton to hear Ahmad Safi, the executive director of the Palestinian Animal League, speaking on a national tour.